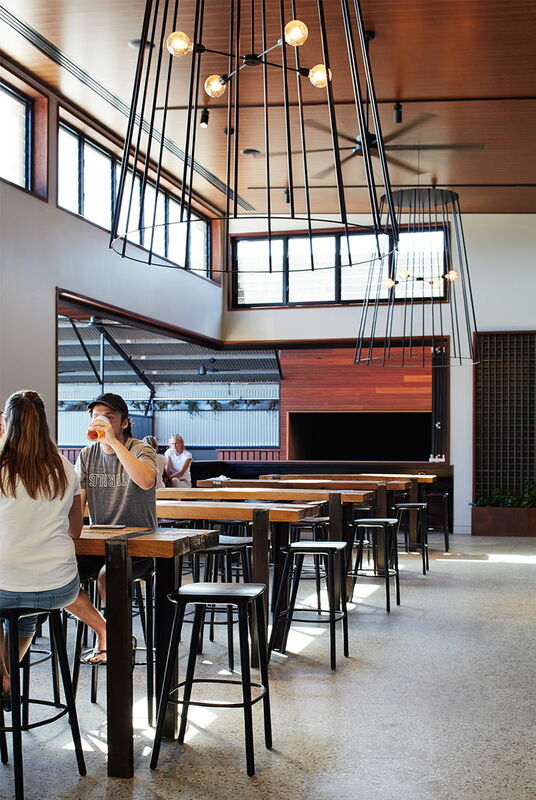 Melbourne design firm Ewert Leaf has transformed a historic former horse training facility into a multi-faceted hospitality space. 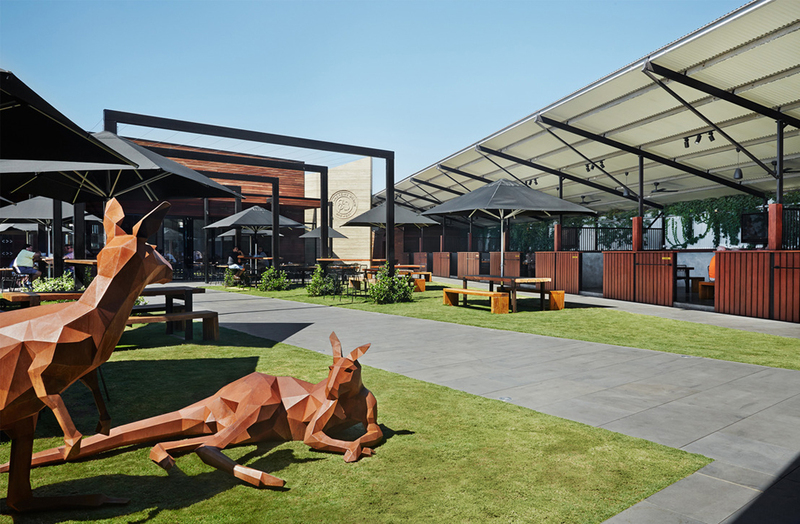 The owners of St Andrews Beach Brewery, which is set on a sprawling 38-hectare property in the Mornington Peninsula region, briefed Ewert Leaf to design a space that gives back to the local community and honours its heritage as a home to some of the most famous racehorses in Australian history. The practice designed an inherently sustainable and functional space to align with the clients’ ethos, as well as their aim for the property to supply 50 percent of the produce required for food and beverage production within five years. 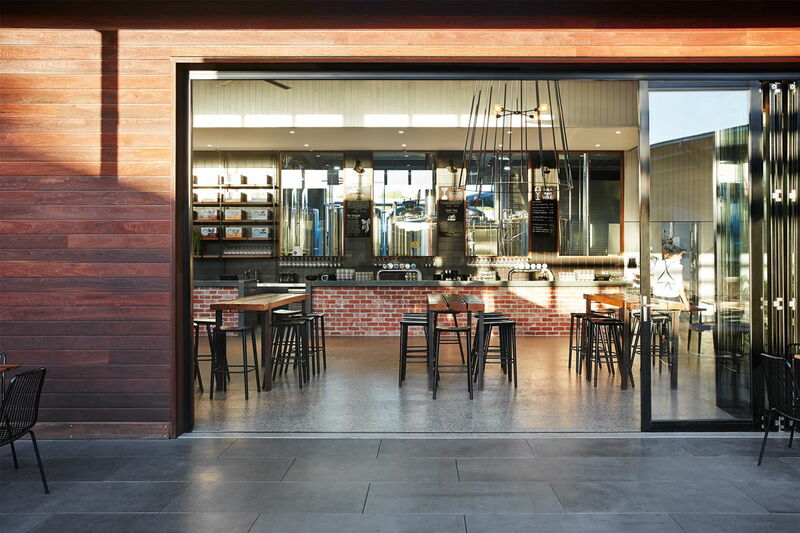 The ‘paddock-to-plate’ venue and full-scale ‘tank-to-glass brewery’ includes a cellar door, tasting rooms and bars. Features and materials from the former structure were repurposed for the new one. “We wanted to pay homage to the existing fabric of the site and reimagine as much of the structure and materiality as we could, as this aligned directly with the sustainable aspects of the business itself,” says director Toby Ewert. A key element in forming a relationship between the venue and the community was collaborating with local tradespeople, landscape architects, engineers and artists. This included one of the clients, who had a hand in the original construction of the equestrian track and was heavily involved in landscaping the orchards and surrounding grounds. 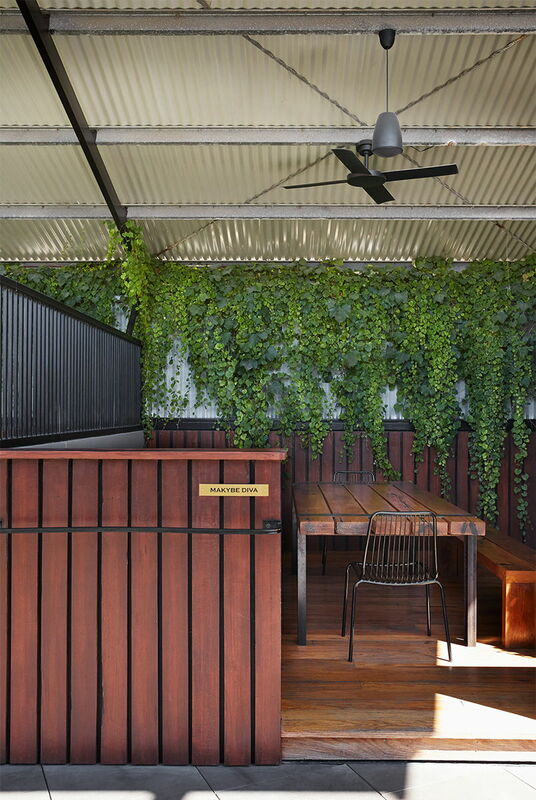 In the courtyard, 16 stables were converted into intimate booths playfully named after their famous former inhabitants, including Melbourne Cup winner Makybe Diva. 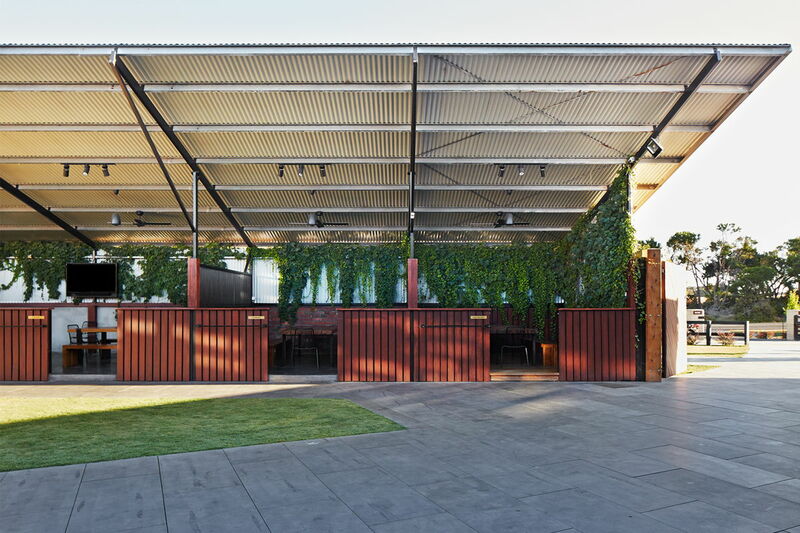 Reclaimed ironbark cladding was incorporated into banquette seating, joinery elements and the venue’s front gate. 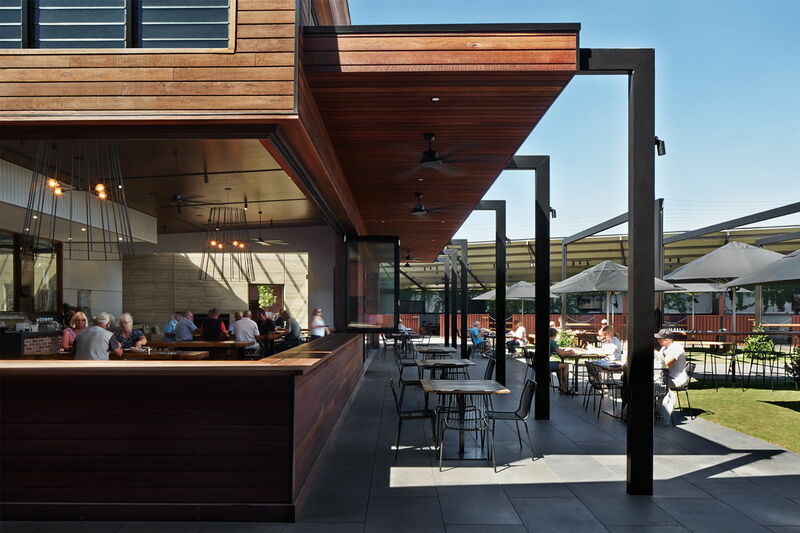 The expansive, kid-friendly patio features farm-style tables and is encircled by honed bluestone tiling. The grassy racing tracks wrapping the site were landscaped with more than 8,000 apple and pear trees, growing into orchards and a self-sustaining agriculture business, which will bear fruit to produce cider down the track. An ample kitchen garden services the venue with seasonal produce and fields of various hops varietals were planted to supply the brewery. 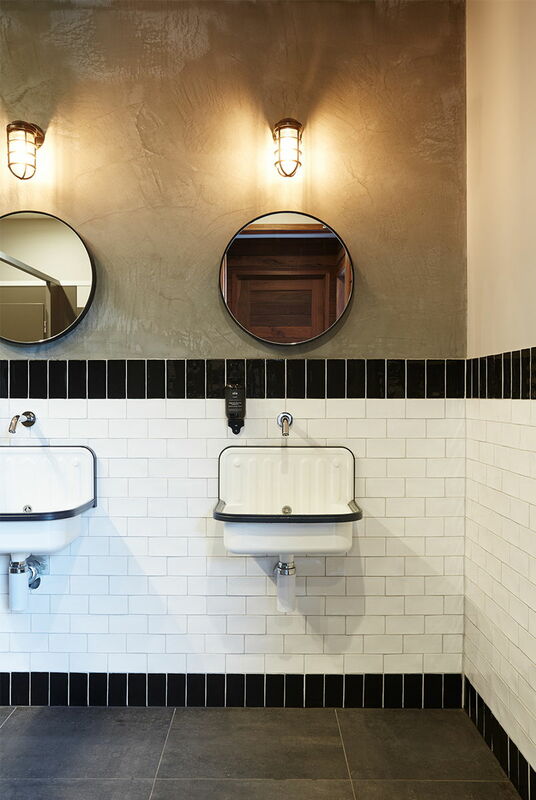 The venue’s interior features a textural bar face constructed from recycled bricks, topped with a titanium counter, balancing the rustic and refined elements to achieve a contemporary aesthetic. Black and steel metallic detailing, custom lighting including sculptural copper-finished pendant fixtures from Satelight Design, and speckled polished concrete floors from Boral are further modern elements. 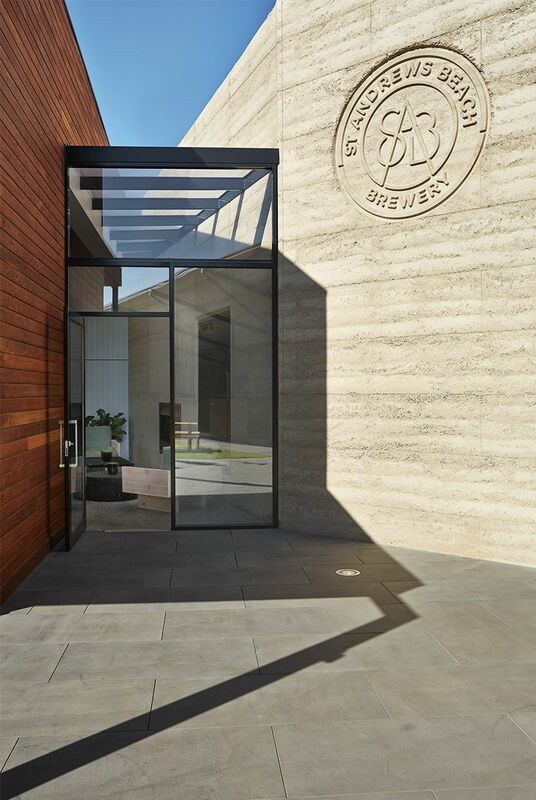 Complementing the natural palette, Ewert Leaf used rammed earth to construct internal walls and bespoke furniture was built from both salvaged timber and Victorian Ash and Tasmanian Oak hardwood. In addition to reclaimed materials, Ewert Leaf incorporated sustainable elements such as slab hydronic heating and louvre windows to enable natural ventilation, facilitating temperature control without a demand on further resources.